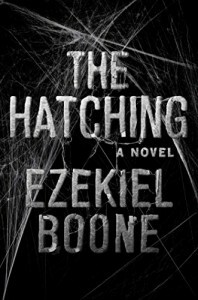 Thank you to NetGalley and Atria Books for providing an ebook copy of The Hatching By: Ezekiel Boone in exchange for an honest review! So let me begin this review by saying that I am terrified of all bugs and insects. Including spiders. SO why did I pick The Hatching to read? Because I love horror. I love to be creeped out and scared. As long as creepy crawlies stay away from me in real life. The Hatching takes a little bit of time to set up, but then it gets good. Really good. This is not the most action packed novel, but what action it has really makes an impression. For example some parts had me screaming, "Ahhh and Ewww and No, no, oh my god, no!" If spiders creep you out at all then this book will terrify you. I saw a small spider in the house later that night when I finished this book and I almost just decided to set the house on fire. My skin is crawling even just writing this review. I had no idea that it was possible to be even more terrified of spiders. I don't think that The Hatching will be everyone's brand of horror, but I think the apocalyptic and sci-fi side will attract a lot of fans as well. The style of the novel kind of reminded me of World War Z (which I didn't finish because that one bored me to tears and I tried twice), but it worked for this book. It has multiple POV's that it follows, but not too many so that it's hard to keep up with. I liked most of the characters, but I do have to say that Mike and Melanie are my favorites. Overall The Hatching is a book that creeped me the hell out. It's an engaging read and written very well. This book will leave you feeling uneasy and creeped out, even if you don't have arachnophobia. I hate spiders, but I loved this novel and I can't wait for the sequel! I recommend The Hatching for fans of World War Z and for horror loving arachnophobes. My husband is also frightened of spiders and by the end of the book I kept telling him that he has to read this!